Recently the Chesterfield Canal Trust completed the construction of a hand made full length replica narrowboat to the design of those that used to ply the nearby Chesterfield Canal. It took several years of loving work by volunteers to build it, using hand tools (no drills). She is called the Dawn Rose, and will eventually be horse-drawn, and a horse has now been acquired for that purpose and is undergoing training. To raise funds the narrowboat is being pulled - by humans rather than horses - from Shireoaks to West Stockwith and back between 4th June and 19th June. Companies or people could sponsor one of the twenty sections of the journey. The Gringley History Club was offered this opportunity, and selected the two and a half mile section skirting Gringley to the west, from Shaw Lock to Drakeholes. Seven foolish volunteers from the club presented themselves at 1.30 p.m. on 11th June at Shaw Lock, and took it in turns in pairs to be roped to the boat, and then quite literally to pull it along. As the boat itself weighs 8 tons and the ballast was 7 tons, plus a few volunteers from the Canal Trust, the total weight was over 15 tons. It was quite difficult to haul, especially from a standing start, but excellent safety advice and instruction was provided by Trust volunteers. A powered more modern canal boat was also in attendance, just in case, and for example took the Dawn Rose through the tunnel at Drakeholes under the A631. The pull took just over 2 hours for about 2.5 miles and the human horses suffered no known casualties. This was all the more surprising since the whole haulage team were eligible for bus passes. The team was supported along the way, and especially at Middlebridge where a crowd had gathered (well, 3 or 4 people I think). Finally at Drakeholes Sue Dunkley turned up with some welcome beers, soft drinks and crisps. 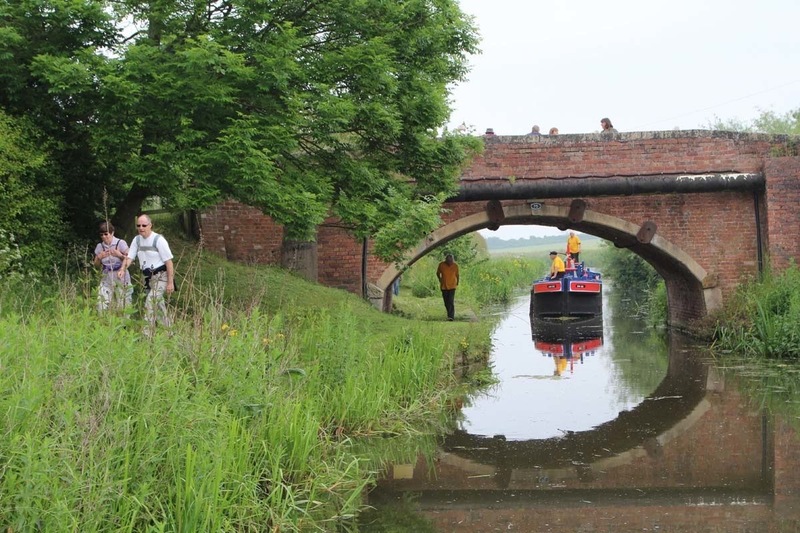 The Canal Trust expected to raise just under £1000 in total from the whole exercise. A fuller gallery of photos can be seen in the SCRAPBOOK section of this Website.